A constant challenge for creating new content in the 23andMe product is the lack of engineering resources. To circumvent that, we often create templates so that non-technical people or designers can create new content. I worked on the templates, visual designs, and specs for the homepage feed, social sharing, and various icon work. We redesigned our homepage to be more dynamic and content-driven. 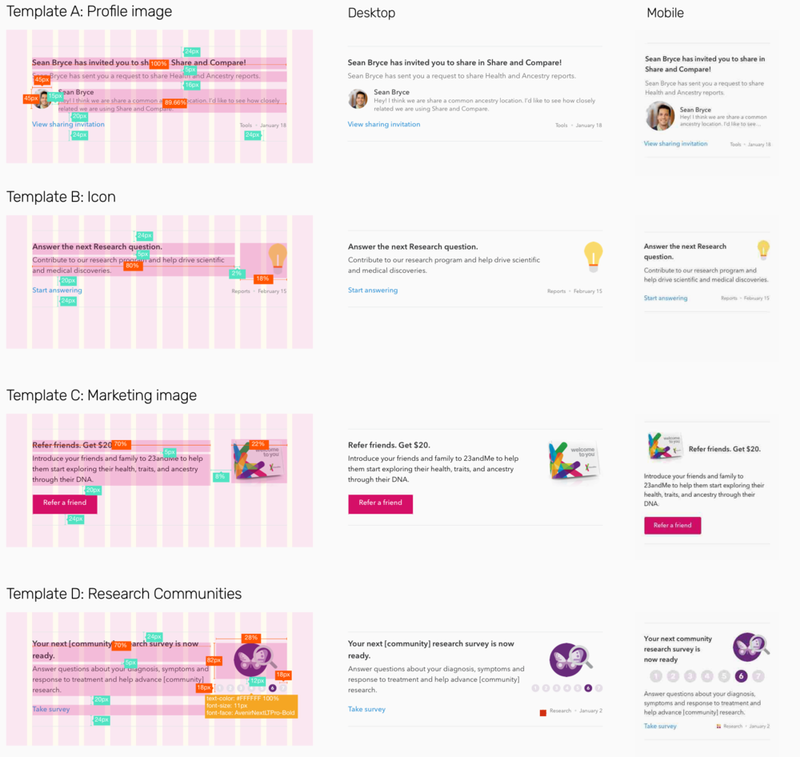 Our whole design team worked together to design and user test two versions of the page. After we got user feedback and stakeholder buy-in, we needed to fill out details on how the page would work. I took on the tasks of working with product to define page content, spec-ing out the page content and interactions, defining responsive behavior, and working with the developers. I defined four distinct feed types and spec-ed them out for both desktop and mobile. These four types were flexible and comprehensive enough that we’re still using them today. I created research insight social sharing templates for Facebook and Twitter. These templates were a hybrid between our product and marketing style. The template files could be edited by other designers or product managers who wanted to change the copy. I created various icons for use in our product. Illustrations I created for an instructional in a Research survey.